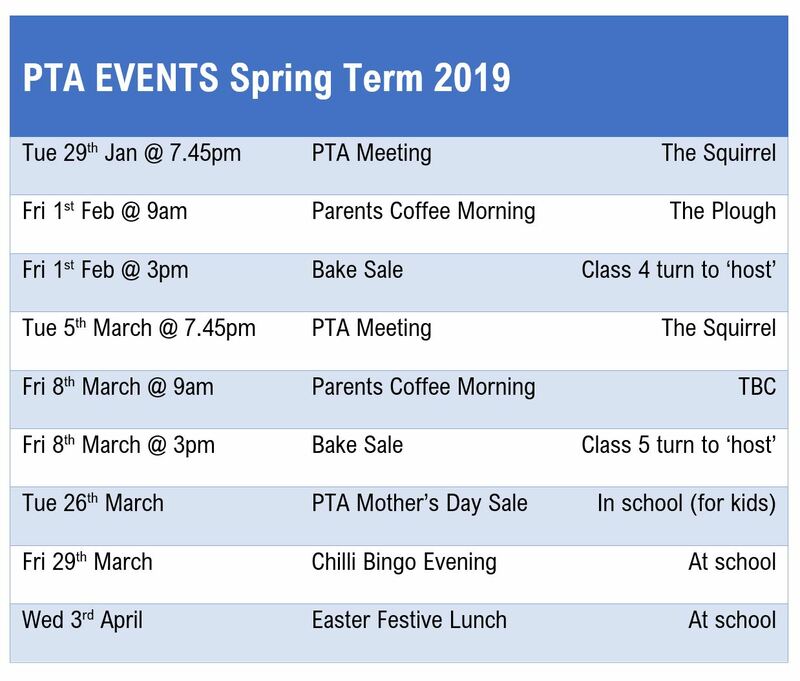 Almost the end of term and next week is a biggie for us in terms of events that the PTA runs for our school. The FESTIVE LUNCH will be on Wednesday so if you haven’t yet paid for your children then you’re running out of time! Also if you have any spare reusable plastic cups then we’d love to take them off your hands so that don’t have to use disposable ones. Also just to let you know that the children will be having HOT CROSS BUNS after the Easter Service on Thursday morning. A huge thank you to the Class 5 parent team who ran BAKE SALE last week. We raised £228.84 which is brilliant. Also a special mention to say thank you to Sian Weatherburn and Annie Baughan who manage our SECOND HAND UNIFORM which generated another £19 in sales. Hope you have a lovely weekend – enjoy the sunshine! 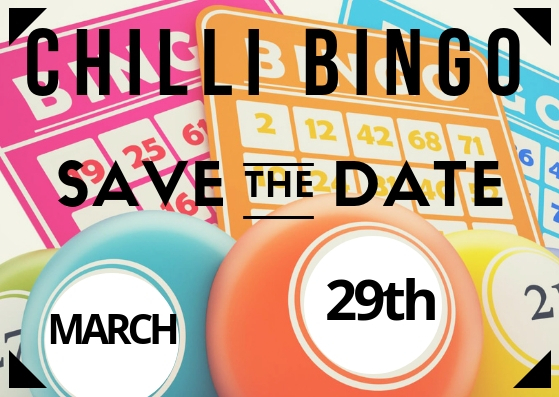 We’ve been asked to extend the Chilli Bingo tickets deadline to Tuesday next week so the NEW DEADLINE to book tickets to this annual event is TUESDAY 26th March. CLICK HERE to book. To save us having to chase everyone to beg them to complete their FESTIVE LUNCH forms please can we ask that you take a look over the weekend if you haven’t already done so. Even if children are not participating in the lunch please can you complete the form so that we know. We have to confirm the food order with the Hit & Miss next week so it would be a real shame if we weren’t aware that you child wanted festive lunch and they then missed out. Also a reminder that if you have any spare/old kids cups at home we’d love them to serve the drinks in at the lunch rather than disposable cups. CLICK HERE to complete your form. Finally a request for any helpers for Chilli Bingo – even if you aren’t able to attend the event we would welcome any offers of support to set up the event on the day. This is a really important event in our fundraising calendar so we want it to go as smoothly as possible and setting up all the tables etc is one area where we’d really appreciate some helpers. 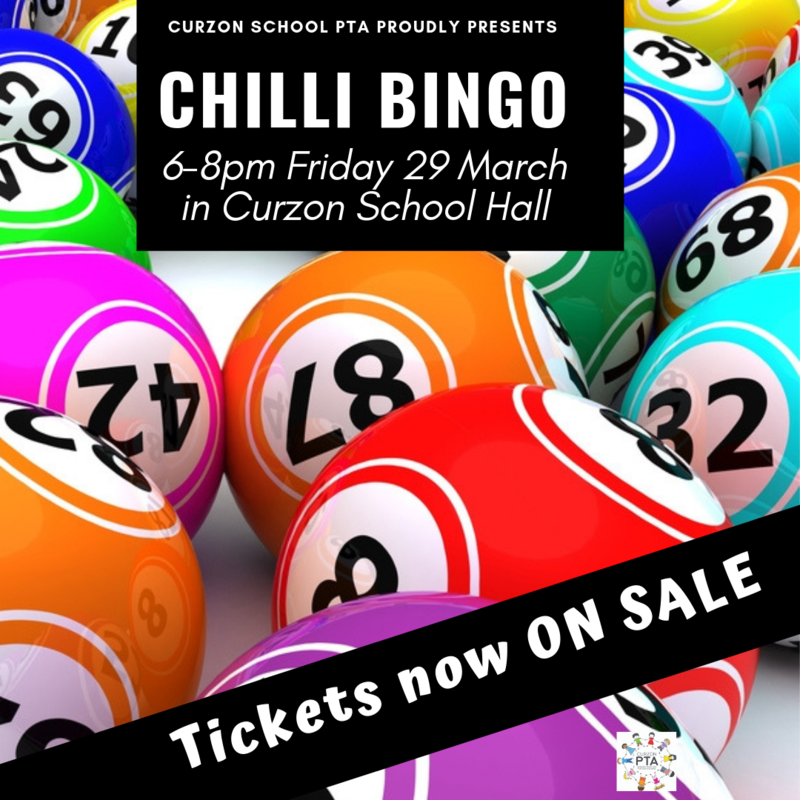 DEADLINE TO BOOK CHILLI BINGO TICKETS is Friday 22nd March. They’re selling fast so if you do want to come please book asap as we have a maximum capacity in the hall. CLICK HERE to book. DEADLINE FOR FESTIVE LUNCH forms is Friday 22nd March. Please complete the form asap. Also if you have any plastic children’s cups you no longer need then please drop them in the box in Earl Howe Lobby. CLICK HERE to book. 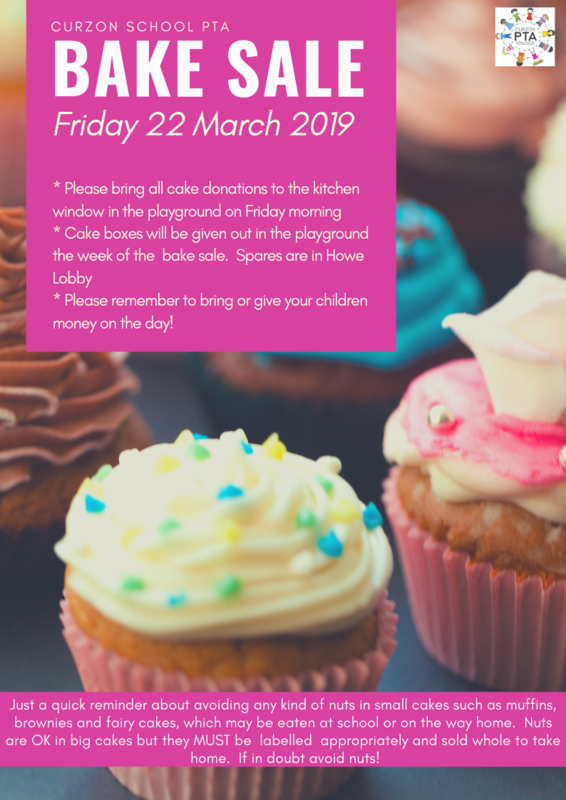 REMINDER – that BAKE SALE is Friday 22nd March. Vicki Dale (Archie’s mum) will be handing out boxes in the playground next week. It’s Class 5’s turn to host! REMINDER – We are also holding our SUMMER SECOND HAND UNIFORM SALE at the same time as the Bake Sale. We have a lot of Summer dresses and shorts – all for only £1. MOTHER’S DAY STALL DONATIONS AND PAYMENT Tuesday 19th March – Finally a reminder that with Mother’s Day only a couple of week’s away, we are running our Mother’s Day stall for the children on the Friday before. The children really do enjoy this event as they get to choose a pressie for mum all by themselves! We are taking donations of items that can be sold on the stall on Tuesday 19th March plus £2.50 per child who wants to take part. For more info please see the termly newsletter that should have come out via Class Reps on email or whatsapp last week. Several reminders this week as there are a few events coming up. 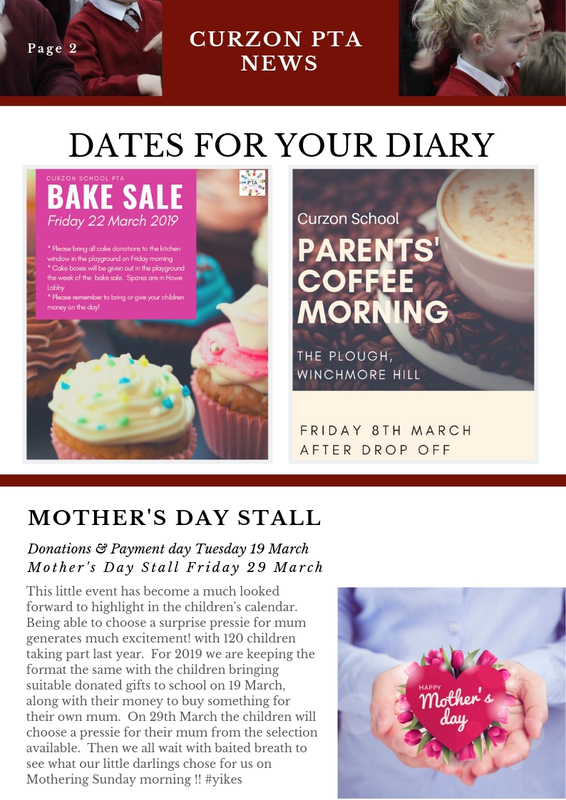 MOTHER’S DAY STALL 29th MARCH – You will have seen from the PTA email/WhatsApp Newsletter this week that the Mother’s Day stall will be taking place on Friday 29th March. The day to bring in your donated Mother’s Day gifts and £2.50 for each participating child is Tuesday 19th March (which is only just over a week away). FESTIVE LUNCH – Wednesday 3rd April 2019 – We are delighted to be holding the Easter lunch again this year, which will take place on Wednesday 3rd of April. This is an event organised by the PTA, entirely for the enjoyment of the children, as they love having a big lunch together in the hall twice a year. As you may have heard, the Hit or Miss is under new management as Michael has retired. Happily, the new owner Peter is willing to continue providing the lunch at cost value. This means the price of the lunch will stay at £5 per child. There is the option to bring in a packed lunch if that is what you and your child would prefer. If you are free on the day, it is great to have plenty of volunteers to get the food served to our children as quickly as possible. If you can help please keep 10am to 1pm free on 3rd of April. To book lunch for your child, go to https://curzonschool.co.uk/pta/festive-lunch-3rd-april-2019/. Please fill in this form by the 22nd of March, even if your child will be bringing a packed lunch as otherwise we will keep chasing you for it! As you may know, in an effort to reduce single use plastic, we trialled using water bottles to hold the squash for lunch at Christmas. This wasn’t very successful unfortunately! What we are proposing to do this time is to use reusable plastic cups. If anybody has any old plastic IKEA (or similar) cups that they no longer use and would be happy to donate them to the PTA, we would really love to have them please. If you could either leave them in Reception or give them to Caroline Oden, we would really appreciate it. If you have any questions, please ask Caroline Oden (Lilianna & Poppy’s Mum) in the playground or email carolineoden@gmail.com. BAKE SALE THANK YOU – A huge thank you to everyone who baked, bought and helped at today’s Bake Sale. We will let you know the total raised as soon as possible. TONER CARTRIDGES – We only need a handful more to be able to send a parcel off (bag of lots received from the church last week) so please do ask around and if you or anyone you know has any to dispose of please give them to Lisa asap. ***TUESDAY 12 February – PTA Meeting at The Squirrel*** 7.45pm for 8pm start. Ends 9.30pm. This meeting is open to everyone so please do come along if you are interested in what the PTA are working on at the moment or if you have any ideas you’d like to share. The funds that are raised are so important for our school, it would be great to see more people at these meetings. ***FRIDAY 8 February – BAKE SALE (Class 4 hosting)*** At school pick-up. Please bring your cakes and goodies to the kitchen window on Friday morning drop-off. Please can volunteers from Class 4 help set up and sell on the day? Please see previous PTA newsletters for info on allergies etc. TUESDAY 29 January – PTA Meeting at The Squirrel. 7.45pm for 8pm start. Ends 9.30pm. This meeting is open to everyone so please do come along if you are interested in what the PTA are working on at the moment or if you have any ideas you’d like to share. The funds that are raised are so important for our school, it would be great to see more people at these meetings. 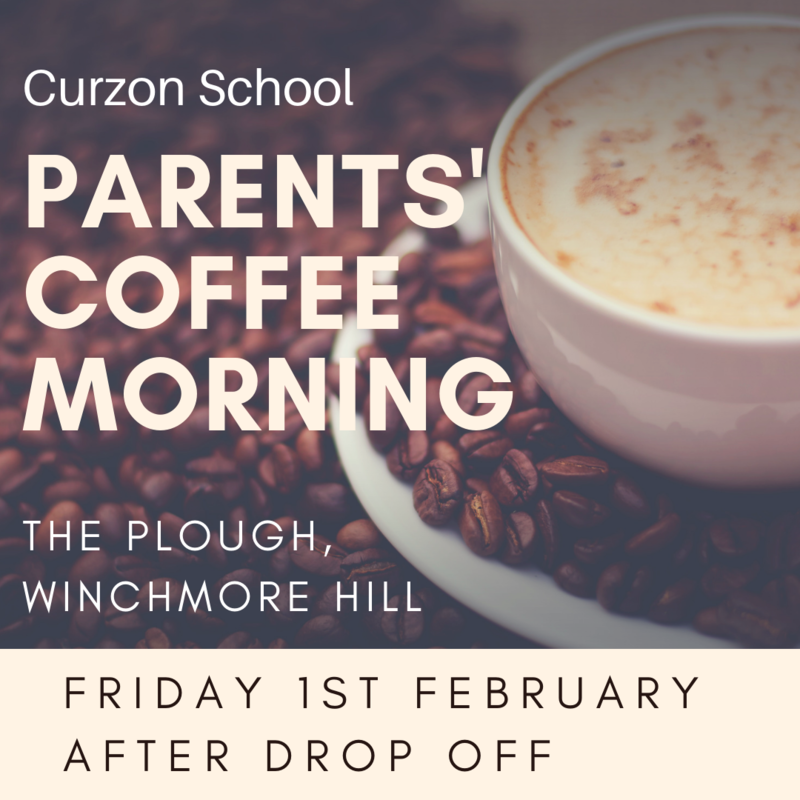 FRIDAY 1 February – Parents’ Coffee Morning at The Plough, Winchm Hill. After am drop-off. A great opportunity to catch up with friends or to get to know other parents over a cuppa. 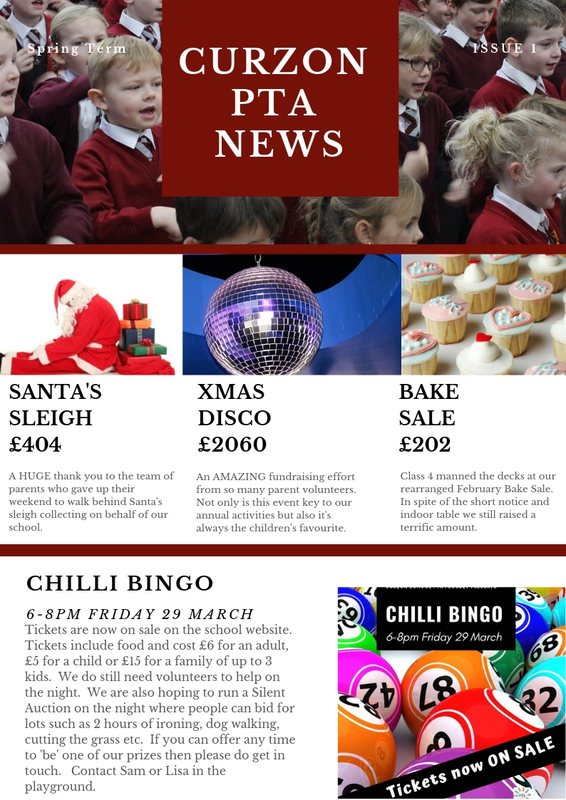 Finally a shout out for more unwanted gifts and bits for the Chilli Bingo Tombola… join the de-clutter trend and bring anything that would make a good tombola prize to the School Lobby or give to Sam Tayler. Only 3 things to tell you this week so will keep it brief. Firstly, the photos from the Disco Grotto of your children with Santa are being processed this week and will be in book bags next week. Secondly, we are still collecting used TONER CARTRIDGES so please do remember to retrieve them from friends and neighbours! Not only will you be recycling for the planet but it’s also a very easy way for us to raise money! Please give them to Lisa in the playground. Please do save 29th March in your diaries for this annual sell-out event. This year there is going to be a big TOMBOLA so if you do have any unwanted Christmas gifts feel free to give them to Sam Tayler, any of the PTA to give to Sam or simply label and leave in the school lobby. The start of a new term with loads to look forward to. Not a huge amount to report this week – just lots of getting sorted and admin so here’s a few dates for your diary. 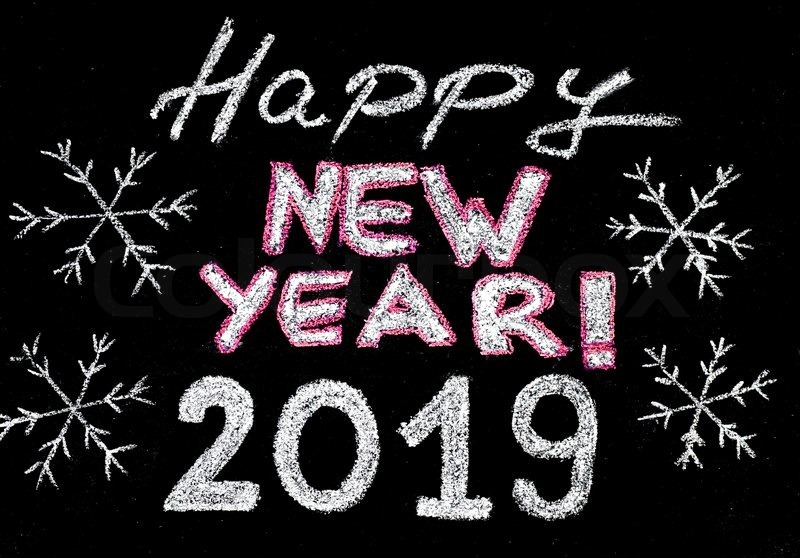 The deadline to order photos from the school disco is FRIDAY 18 JANUARY (that’s next week!) so don’t forget to go and look if you haven’t yet. Click here to view and if you can’t remember the password then do ask your Class Rep or What’s App group. Also just reiterating what we sent out at the end of last term. A HUGE thank you to everyone who helped with fundraising last term. From baking to serving, donating to buying – everyone’s contributions are so important for our children. If you’re wondering what you can do this year to help make a difference then please don’t forget to register on the Easy Fundraising site so that every time you buy something online, a donation can come to Curzon. And if you need more labels to avoid everything ending up on the lost property table at the end of term, then Stikins also give a % to Curzon on any purchases made. Links to both websites below if you simply click on the logos.